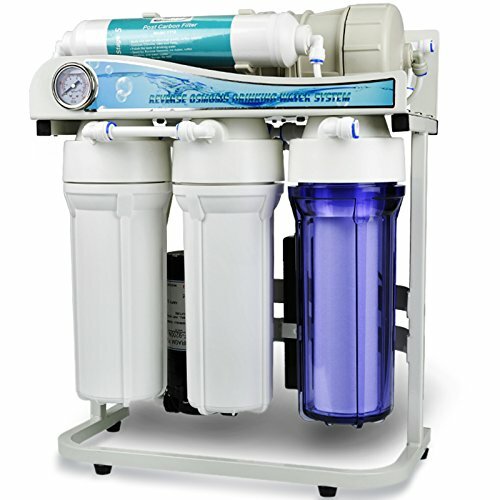 Unsure which whole home reverse osmosis system to choose? We take a close look at 3 of the market leaders and see which comes out on top. We all need water, but with current worries about the purity of water supplies, it’s no wonder that more householders are thinking about how they can make sure that the water out of their faucet is safe to drink. Here, we take a look at some of the leading whole home RO systems so you can make sure that your family can benefit from the safest, purest water possible. Since not every water filter is created equal, we bring you a compilation of whole house reverse osmosis system reviews so you can make a well informed choice when it comes to buying one for your home. We’ll tell you which features to look out for, which brands are leading the way and which systems are the most reliable so you can avoid making an expensive mistake. What’s A Whole House RO System Anyway? How Do I Choose A Whole Home RO System? Do I Need A Whole House System? How Does A Whole Home RO System Work? Is A Whole House Reverse Osmosis System Right For Me? See how the top whole house reverse osmosis systems compare in the table below. Check out the table key immediately below the table for an explanation of the features. Water Production Rate: this figure describes the maximum amount of clean water the filtration system can provide over the course of a day. It's measured in gallons per day (GPD). Waste Water Ratio: reverse osmosis systems naturally waste water as part of the filtration process. This ratio represents the amount of waste water for every gallon of clean water produced. For example, a ratio of 2:1 means 2 gallons of water is wasted for every 1 gallon produced. Take a closer look at our recommended models in this section as we discuss the key features and list the pros and cons. Find out exactly what you get for the money in our whole house reverse osmosis system reviews. This whole home filtration system has been designed specifically to supply clean drinking water on demand for small businesses, small restaurants and large families. With this in mind, it is capable of producing an impressive 500 GPD (gallons per day) under the best possible conditions, although the true output can vary depending on the chemical properties of the water and the temperature. On average, the output of clean water is around 10 to 15 psi. This tankless system features a patented dual-flow reverse osmosis membrane so its output flow will stay consistent. Even better, it boasts a 1:1 drain ratio, which is pretty exceptional. Reverse osmosis filtration is notoriously wasteful with some systems wasting as much as three gallons of water for one gallon of clean water. The trade-off with these devices is incredibly effective filtration at the cost of some waste water. A 1:1 ratio is about as good as it gets and makes this one of the most economical whole house RO systems on the market right now. Thanks to its five different filtration stages, you can be confident that as many as 99% of over a thousands known pollutants will be removed from your water supply. Targeted water contaminants include lead, fluoride, chlorine, sulfur and arsenic as well as pathogens and pesticides. 5 micron polypropylene sediment filter - removes dust, dirt, and larger particles. Lasts for around 6 months. Granular Activated Carbon (GAC) - targets chlorine specifically. Improves the water taste, color, & odor. Lasts for around 6 months. Carbon Block - removes any residual chlorine. Further improves taste. Protects the RO membrane. Last for 6 months. Reverse Osmosis Membrane - removes contaminants down to 0.0001 microns in size. 99.9% impurity rejection rate. 2 year lifespan. * Filter lifespans are the figures provided by iSpring based on an average family home. Lifespan is dependent on water consumption, temperature, quality, and pressure. Reverse osmosis water filtration is currently the most effective method available to us in our homes. The range of contaminants removed and the degree of filtration is unrivalled. It's the only type of home filtration that will effectively remove fluoride from water too. If you’re looking for a whole home RO systems that's also suitable for light commercial use, the iSpring RCS5T won't let you down. If you add a storage tank to the system, its water flow rate will increase further to provide a stable and continuous pure water supply to any light commercial setting. Drawing water from two sides, this on-demand reverse osmosis system doesn’t require a storage system to be in place when used in a residential setting since it’s capable of producing up to 500 gallons of clean water every day. This makes it an ideal advanced system for residential users who want impressive performance with absolute convenience. If you’re living in an area with a low water pressure source, this could also be the ideal system for you since it’s suitable for use with sources as low as 25 psi. It comes with a one-year money back satisfaction guarantee to ease those anxious minds. Bottom Line: Designed to suit the needs of most larger families or light use commercial settings, it works well in low water pressure environments and can be paired with a storage tank for an even better flow. In our opinion, this is the best whole house RO system out there for the money. The Hydro-Logic Evolution boasts huge flow rates making it one of the industry’s most efficient systems. However, with a 2:1 waste to purified water ratio, there is a drawback when getting such impressive clean water production rates. This system has been proven to lower the ppm (parts per million) level of total dissolved solids by as much as 95% to give you peace of mind that your water supply will be clean and non-contaminated. This system is made from a highly durable polypropylene to ensure a long lifespan and excellent robustness and since the system is completely tankless it’s much more convenient to use in a domestic setting. However, despite its lack of a tank, it’s still capable of producing up to 1000 gallons of clean and pure water per day, which is more than adequate for most household needs. This system features two reverse osmosis membranes as well as a carbon material/KDF filter together with all the necessary fittings to get it up and running. It does lack a sediment pre-filter however. Without the pre-filter to remove large particles like dirt and dust, the membrane isn't protected from clogging. Dirt/sediment filters can be purchased relatively cheaply, and we'd recommend running one before this unit so that you reach the full lifespan of its filters. Capable of removing unwanted contaminants from your water supply such as lead, arsenic, sulfur, chlorine and fluoride, this system will ensure that your drinking water tastes great. Bottom Line: If you have a larger family and want one of the most convenient and easy to install whole house ro water systems on the market, this model is a good choice. Its durable construction will ensure a long lifespan while its tankless system is perfect for domestic use. 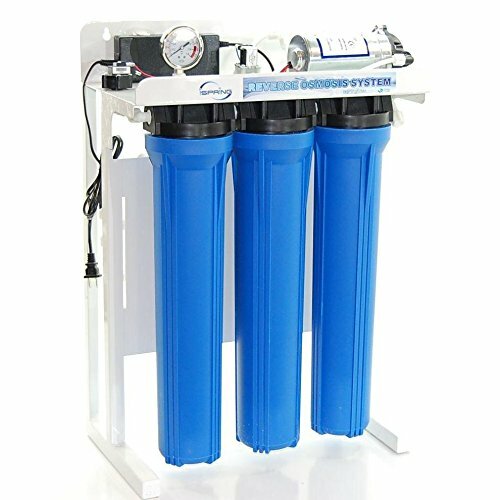 If you’re looking for the best whole house reverse osmosis system which is also suitable for light commercial use, the iSpring RCB3P could be a great choice. 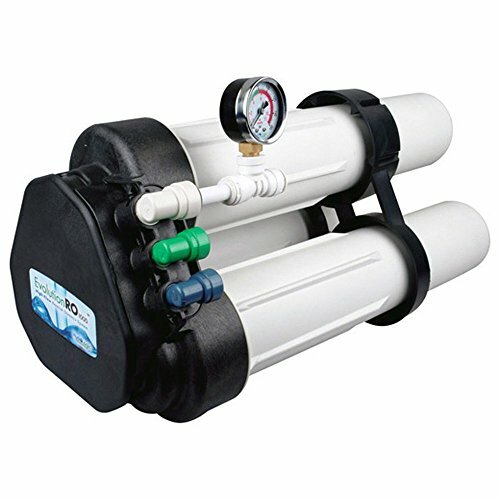 Perfect for use in labs, salons and restaurants, this model has a feed water pressure of 22-95 psi while its oversized 20 inch filters are capable of providing a massive 30,000 gallons of clean and pure filtered water – double the amount that an industry standard 10 inch filter can produce. This system boasts three 100 GPD high efficiency RO membranes which combine to produce as much as 300 gallons of clean water every day, and with its free-standing frame, inbuilt pressure gauge and booster pump, it’s a convenient solution for any home. Its inbuilt booster pump is capable of increasing the purified water production by boosting the water pressure up to the best possible level to facilitate the process of reverse osmosis. Since this model is also compatible with the majority of pressurized storage tanks on the market, it can increase its pure water production even more (although no tank comes included in the price). This booster pump doesn’t just increase the production rate of the system, it also maximizes efficiency of the drain to pure water ratio, and since it’s easy to spot a pressure drop on its gauge, it’s quick and easy to determine whether the pre-filters need changing. The 3/8” fittings allow for an even faster water flow and since this system is capable of removing all kinds of impurities and contaminants from your water supply including toxins, heavy metals, hardness and chlorine, it gives you complete peace of mind that your family or customers will be protected from potentially harmful pollutants while also serving up deliciously clean-tasting water. The system is even protected by lifetime support from the manufacturer, so you’ll have nothing to worry about should the system develop an issue in the future. It couldn’t be simpler to install this RO system in your home or commercial premises and its free-standing frame gives you the unique benefit of being able to move it around, placing it anywhere a better water supply is required. Although this system works very well in most settings, if your business premises or home has an especially high water pressure, a reducing valve will be necessary in order to utilize this unit properly, since its maximum rating is 85 psi. Although it’s technically possible to run this system at a higher level, the additional pressure which is put on the system is likely to result in a premature failure. Also, if your business or home is connected to a fairly poor source of water, there is likely to be excessive wear and tear around the system’s motor seals which again can result in a premature failure. In the worst case scenarios, this has been as early as just 60 to 90 days. When it comes to filter changes, one change per year is generally sufficient, but if you try to extend their lifespan further, additional pressure will be placed on the motor seals and, again, the result is likely to be a problem. Bottom Line: If you’re looking for a flexible and convenient system for your large family or commercial premises, this is the perfect model for you. Producing a large amount of clean and pure water every day, it will suffice most large demand needs. Although there are lots of whole house RO water filters on the market, knowing how to choose the right one for you couldn’t be more important. So, here’s some expert advice to point you in the right direction. As you can expect from its name, a whole house system is capable of cleaning and purifying all of your home water supply. Every time you turn on your faucet in your kitchen or bathroom, you can be confident that all the water which comes out will have been filtered and will be clear of unwanted pollutants and contaminants. As an added benefit, filtered water is also delivered to your toilet, washing machine and shower – basically any appliance or fitting in your home which uses water. This protects your whole family’s health and well-being to the max. If you’ve decided that a whole house model is for you, you’ll need to be aware of which features to look out for before you buy, otherwise you could end up making an expensive mistake. Here are a few things to bear in mind. Water Flow – each whole house system will be capable of producing a different volume of clean water per minute. As all of the water which enters your property will be filtered, the same amount of water will reach your shower, faucets, toilets and appliances. While a small household may cope with a system that’s only capable of producing about 10 gallons per minute, if you have a bigger family or want a system which is capable of providing enough clean water for your commercial premises you’ll need to choose a much more powerful system. Before choosing a system you should estimate the daily water use of your home and make sure it's adequately covered by the water output of a water filter. Filter Types – there are different filters to block different pollutants and contaminants. It’s important to choose a model which is effective on all the contaminants which are present in your home or business premises’ water supply. Good practice is to have your water tested prior to buying a new water filter and make sure you have all bases covered. Thankfully, reverse osmosis technology is very effective against pretty much all contaminants you are likely to find in your water. If you have especially high clean water demands, this is definitely something you should bear in mind since you’ll want to get the best value for money with the lowest possible amount of maintenance required. Tank – do you need a system which has a tank or a do you need a tankless system? Tankless systems are ideal for use in domestic settings but they may not have the capacity to cope with a very high water demand and there may be a delay in on-demand water production from your faucet when operating a tankless model. Tankless systems can always be used in combination with a tank should you decide to do so. The same can't be said of tank usage to non-tank usage systems. Maintenance/Installation – don't overlook the installation process. Will you install it or will you use a professional? Do you have space to install it? Do you own your property and have the right to make these changes? Also, changing the filters takes a bit of muscle. Are you fit and able enough to get the job done? Carbon based filtration isn't really necessary if you intend to use the water solely on the lawn. Water pressure – you’ll need an adequate amount of water pressure to push the water through the system’s membrane in order to filter the contaminants out. Although most homes in urban areas meet the 40 psi minimum water pressure requirement, if you have a lower pressure than this you’ll require a booster pump in your system (most of these models actually come with a pump). Higher water pressures provide a more efficient filtration process and ensure the reverse osmosis membrane lasts as long as possible. If you choose a system which requires frequent filter replacements, you’ll need to bear in mind the higher overall maintenance costs of running your system. It’s only by taking all of these costs into account that you can determine the best value model for you. The primary reason that most people opt for a whole house reverse osmosis system is because they’re worried about the quality of the water from their faucet. Simply put, reverse osmosis is the most effective form of water filtration available to us in our homes. And with a whole home unit, there's clean drinking and bathing water for all the family. Even for families who are connected to the municipal water supply, the concerns about the purity of the water which reaches your faucet are very real. Chlorinated water, for example, is very common and it can spoil the taste of food and drinks made using water from your kitchen faucet. Although chlorine has long been used to disinfect water in treatment facilities, it may actually be bad for your health. There have been recent studies which have shown that drinking a lot of chlorinated water could damage your health. Not only can it harm your well-being, it could also have a negative effect on your hair and skin. Skin dries out excessively when washed with chlorinated water while your hair often takes on a duller aspect. If you use a whole house RO system, however, the chlorine will be removed from the water so your hair, skin and general health will receive a boost. If you’re worried that your domestic water supply isn’t as clean or pure as it should be, you can carry out testing to find out exactly which contaminants, pollutants and impurities are in your water. There are home testing kits available which will identify anything unwanted which is in your drinking water. These tests will let you know whether you have overly chlorinated water, whether there is a high level of bacteria in your drinking water or whether there are heavy metals lurking in there. You may not even need to do a water test if you can taste chlorine in your water or if you can spot small particles floating in your glass. In either case, it makes sense to invest in a whole home RO system for your peace of mind. You can then be sure that you’re drinking the safest and cleanest possible water. Although there are several types of water filtration system on the market, RO is often the best choice. Why is this the case? They can remove pretty much all common contaminants. They are 99% efficient when it comes to removing pollutants and contaminants in the water to make it safe and clean to drink. Thanks to the semi-permeable membrane, the contaminants such as heavy metals, ions, dirt, viruses and bacteria are completely isolated from the water. They remove unpleasant odors from the water unlike regular water filtration systems. This is due to the carbon filter which has activated carbon in it to attract and filter out the odor-causing contaminants like iodine and chlorine. They're low maintenance. While regular water filtration systems require regular rinsing and washing, RO filtration systems have filters which are regularly washed by the system itself. This means that they are easier for households to care for over the long-term. They are economical and have a long lifespan. They usually have a longer life than a regular water filtration system since the membranes are cleaned by the water system itself. An RO membrane should last for a couple of years and their maintenance is only minimal, with longer gaps between filter replacements. This means that they are cheaper to run for a more economical choice. They are capable of removing inorganic molecules, which a regular water filtration system cannot do. The RO membrane can remove molecules like inorganic nitrogen, carbon and phosphorus which are usually found in brackish water and which can cause hard water to form. They can also help to remove chemical contaminants like bleach which could be present in water supplies. There are two kinds of home reverse osmosis devices which can be installed in a property. A point of use system is the first. It is installed at just one outlet, usually in the kitchen, which is then used for all drinking and cooking. The second, and most convenient system, is the whole house system which is capable of treating all the water from the moment it enters your property. A reverse osmosis treatment system is composed of a number of components. These include the pre-filtration system, the membrane chamber, the atmospheric storage tank, the re-pressurization pump and occasionally a calcite filter which increases the pH or adds more total dissolved solids into the water. Reverse osmosis treatment is designed to remove a large spectrum of contaminants and this is why it is believed to be the most cost effective form of home water treatment system. An RO system is capable of removing between 98% and 99% of contaminants from the water. This includes sodium chloride, TDS (total dissolved solids), nitrate, sulfur and arsenic as well as many other organic and chemical contaminants known to exist in our water supply. Thewhole house RO water system is sited between the point where water enters your home and the water source itself, whether that be the well pressure tank or the municipal supply. When the water enters your domestic system it will be passed first through the pre-filtration stage. This will capture all the larger particles such as iron, chlorine, manganese, sulfur and some other contaminants. Once the pre-filtration stage has been passed, the water will then enter the membrane chamber. Here the water will be pressurized so it can pass through the membrane. There are several types of membrane system, however the most common is spiral wound. There are two forms of spiral wound membrane system – the cellulose triacetate (CTA) membrane which is tolerant to chlorine and the TFC/TFM version which isn’t tolerant to chlorine. Once the water has passed through its membrane treatment process, it is then often passed into the atmospheric storage tank where it remains until it’s needed. Not all systems have a tank. Those which don’t are on demand systems, and while they’re easier to store in your home there will often be a delay when turning on your faucet. If you’re worried about the quality of water coming out of your faucets, you may definitely want to consider investing in one of these devices. It’s the best way to receive clean, healthy water and it’s one of the most recognized ways to protect your own health and well-being and that of your family. This is especially the case if you, or one of your family members, has a sensitivity to chemicals. If you live in an area which is known to have a high level of contaminants in the water such as sulfates, sodium or chlorides which affect the smell or taste of the water, or of you live in a hard water area due to high TDS levels, you’ll find a whole home RO system will resolve all those issues too. It’s a cost-effective, simple method to treat water and to supply you with high quality, healthy and safe water for you and your loved ones to drink without needing to buy bottled water. Heavy metals such as chromium, copper and arsenic as well as pesticides, chemicals, viruses, TDSs and bacteria are all removed from the water when you opt for awhole house RO water system and since they are simple to maintain with only periodic changes required for the filter, you’re sure to see the benefits of choosing one of the latest cutting-edge systems. If you’re ready to invest in a home water filtration device, the whole house reverse osmosis system reviews that we’ve outlined here will help to point you in the right direction. By reading our expert advice, you’ll now have everything you need to know at your fingertips about how to select the perfect model for you. If you follow our buyer’s guide, you’ll avoid making an expensive mistake and find that your home’s water supply is cleaner, safer and better tasting than ever before. I appreciate the help and great information. I’ll have a time estimating monthly usage to top off My pool at times. Also thinking of not replacing my old water softener if I go with an all house RO system. A possible benefit not having to carry those salt bags. And thanks for the product recommendations!